BP (BP) has a big problem. No, this isn't all about 2010's horrific deep-sea oil rig explosion that cost several human lives and took a heavy toll on the Gulf of Mexico's marine life and the tourism of coastal towns in the area. BP set up a $20 billion fund to compensate victims shortly after the incident. It remains to be seen if that will be enough -- or if it will ultimately be BP, Halliburton (HAL), or insurers that have to fork over the most money in what has been the most catastrophic marine oil spill in the history of the petroleum industry. As devastating as the episode was and continues to be, BP actually has bigger oily fish to fry these days: BP has been missing Wall Street's profit targets lately. Analysts see revenue and profitability declining this year. The "boycott BP" movement may be largely over, but the company is now dogged by sloppy operations and a general trend toward less gasoline consumption. In short, BP's a mess. A few months ago, new ads began popping up promoting the once-popular vacation getaways along the gulf. Florida, Alabama, Louisiana, and Mississippi playfully compete with one another to point out the area's tourist attractions. It's a peculiar ad until you see that this "cordial invitation to visit the Gulf" is actually sponsored by BP. We're now nearly two years removed from the incident, but BP continues to pay the price for it. It has already committed to shell out $92 million over three years to promote tourism in the Gulf region. BP is doing the right thing -- now -- but there's a bigger price to pay. 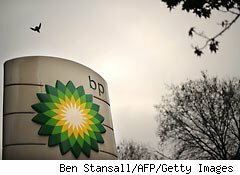 Shortly after the spill -- when "boycott BP" rhetoric was at its loudest -- independent BP station owners were reportedly suffering a 10% to 40% decline in business. The idea of reverting to the Amoco name that many of these stations operated under before the BP acquisition was bandied about, but BP decided to stick with its now tarnished brand. How could BP blame independent station owners if they wanted to abandon ship completely? Things aren't going in the right direction at BP. Analysts see the oil giant earning $6.52 a share this year, less than the $6.75 a share it's pegged to post for all of 2011 and even less than the $6.55 a share it rang up during the boycott-rific 2010. The pros also see revenue tanking 2.4% to $348 billion. Bulls will argue that declining profitability is still profitability. It's also hard to dismiss a company positioned to generate nearly $350 million in revenue. However, it's hard to take these forecasts too seriously. Let's go over BP's last four quarters, comparing what Wall Street was banking on the maligned petroleum giant earning and the net income it ultimately spewed out of its nozzle. Let's not blame the repeated shortfalls on the nature of the industry. Top dog ExxonMobil (XOM) has beaten Wall Street's bottom-line estimates in three of the past four quarters. Missing the mark has been a BP-specific problem. How confident can you be that BP will earn even $6.52 a share given the track record of the pros that have been overestimating its profit potential over the past year? Three months ago, analysts were targeting a profit of $6.88 a share out of BP. It's a different story now. BP's performance slipping during a time of cascading prices at the pump would be understandable, but that's not what's happening. Increasing demand in China and tension overseas have been moving oil prices higher, and analysts see prices climbing again this year. There's another trend working against all of this. Have you checked out the mileage on the latest breed of hybrids? Even traditional cars are cashing in on technology that makes new automobiles more fuel efficient. We don't need to drive less to spend less on gasoline. Newer forms of energy and the slow migration to electric cars will also begin eating at the powerhouse that BP was before the Deepwater Horizon tragedy. BP isn't going away. However, it may very well have peaked last year. Shareholders may not see it that way. The stock is trading closer to its 52-week high than its 52-week low. Investors may be wooed by its chunky 3.9% yield, but how sustainable can that be if earnings continue to slide as fuel consumption trends continue to work against BP and independent station operators move away from the broken BP brand? The pain at the pump that used to be yours now belongs to BP.